I designed these cozies to add a little class to my occasional coffee-to-go instead of the paper sleeves they give you at the coffee shop. I had previously made some cozies using worsted weight yarn, but the result was too bulky-feeling for my taste. 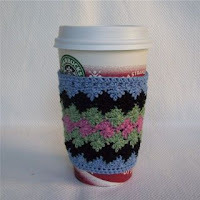 The cozies use either #10 or #3 Crochet Thread. 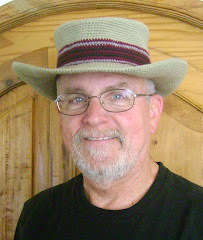 The multi-colored one uses #3 size thread. When my wife saw it, she asked if I could make one in Red and White to match Starbucks new "Holiday" cup. I didn't have #3 thread in those colors, so I made her one using #10 thread from my stash. I've added the pattern, which contains versions for both thread sizes, to my Ravelry and Etsy Stores. Thanks, Libby - they're also much more comfortable (and secure-feeling) than the paper or the thicker yarn versions - at least to me. You can make your own fashion statement. Make several to coordinate with your wardrobe. 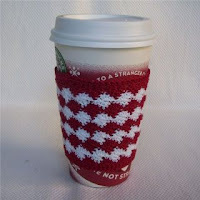 I just made one early this morning for my oatmeal and coffee glass and then, saw YOUR cup cozy! SO much prettier! Think I'll give it a go but see if I can make it without looking at your pattern. You're an inspiring instructor!